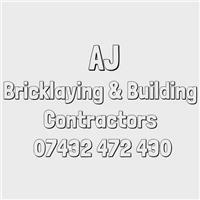 AJ Bricklaying and Building Contractors are a family run business established over 5 years ago but with 25 years’ experience in the building and construction trade. I am a time served bricklayer and have been in the trade since I left school at 16. I then went on to learn bricklaying and worked on many well recognized projects both domestic and commercial. I am a highly skilled bricklayer and have over 10 years’ experience. Along the way I gained valuable skills and a great knowledge of various trades. I decided in 2013 to set up my own company with one aim in mind, to offer the best building services at a reasonable price. Myself and my well experienced, highly skilled team can offer a fantastic service and knowledge of your building needs. We are specialists in Extensions, Porches, Conservatories and Loft Conversions. We also carry out any landscaping from full garden renovations to single brick walls. No job really is too big or too small! So if you're planning on creating that extra bedroom with a loft conversion or an extra kitchen space with an extension please contact us today! We understand the importance of having building work carried out and what an incredible difference it can make to your family home. We offer a competitive and free no obligation quote. Thanks for taking the time to view our page.